Brooks passed for 5118 yards and 33 touchdowns in college and was chosen by the Green Bay Packers in the fourth round of the 1999 NFL draft. He made the team but, as a backup to Brett Favre and Matt Hasselbeck, was never activated during the ’99 season. 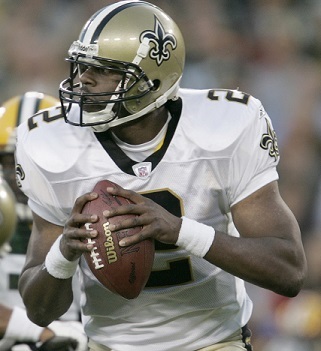 Brooks was traded to New Orleans in 2000 to back up Jeff Blake, but when the veteran went down with a broken foot, he got his opportunity to start and played well, completing 58.2 percent of his passes for 1514 yards and 9 TDs and leading the Saints to a Wild Card playoff win, the franchise’s first ever in the postseason. With his strong passing arm and excellent mobility, he followed up in 2001 by throwing for 3832 yards and 26 touchdowns (although with a completion percentage of just 55.9 and 22 interceptions) and rushing for 358 yards. While consistency was an issue, Brooks was a fine athlete with the ability to make big plays. Saints went 9-7 to finish third in the NFC South while leading the conference in touchdowns (49) and scoring (432 points). Brooks achieved career highs in 2003 by completing 59.1 percent of his passes with a rating of 88.8, giving up just eight interceptions while throwing for 24 TDs. His performance dropped somewhat in ’04 and after a dismal year both for him and the team in 2005, Brooks moved on to the Oakland Raiders. All eight of his starts were losses as he threw for just three TDs with eight interceptions in his last season. Overall, Brooks passed for 20,261 yards and 123 touchdowns and rushed for 1534 yards with 13 TDs. His 120 TD passes with the Saints made him the franchise’s career leader at the time of his departure (long since passed by Drew Brees) and, while his career was ultimately disappointing, he was elected to the Saints Hall of Fame in 2014. Another NFL quarterback, Michael Vick, is a cousin to Brooks.